Natural Mystic Sanctuary was created in June 2013 by Sam and Karina Starnes. After travelling around Sri Lanka for a couple of weeks they visited the rainforest area. Luckily they discovered this land and fell in love with the huge Banyan tree, the river with it´s natural pools and the peaceful surroundings. NMS is a self sustainable living project to protect the environment and provide a safe place for the trees, plants, animals and people. After building a small mud house to live in, over 1000 trees were planted. These were to replace the trees that would have been here before, most were cut down around 100 years ago to make this a tea estate. The planting included fruit, spices, hardwood and rare ayurvedic trees as well as some vegetables and herbs. The upper buildings were then built and completed in Nov 2016 when the Eco Lodge was started, allowing others to come and enjoy this piece of paradise and support our project. NMS continues to plant and grow organic fruits, spices, herbs and vegetables to supply fresh and natural food to it's guests. Is Natural Mystic Sanctuary the right place for you? With 6 acres to explore and a mix of tea plantations and tropical rainforest all around, NMS provides the perfect environment for people who are simply looking to relax and enjoy nature, as well as for those that are looking for more adventure. If you love the idea of waking to the sound of nature, having a bath in one of the natural pools, taking walks in the local area or just relaxing and watching the nature around then this will be a small piece of paradise for you. We know however that this environment is not for everyone so please consider the following points before booking your stay with us. Since it started Natural Mystic Sanctuary has attracted an increasing number of different species of wildlife. With many beautiful animals, birds and insects to see Nature is all around you. A nightmare for some, a dream for others! Natural Mystic Sanctuary is accessed by crossing through a shallow river and going up a rough stone road 500m, only 4x4 vehicles and motorbikes can come up the road. It is a lovely walk up through the tea plantations and with advance notice we can help with luggage. You are rewarded with a tranquil place away from the main road. However being situated on a hill side guests should be reasonably fit enough to walk around our site. Due to our perfect climate, warm during the day and cool at nighttime, we do not have fans or air-conditioning and there are no TVs in the rooms. Wi-Fi is available in the restaurant area, the reception is variable. Natural Mystic Sanctuary is for peace seekers and nature lovers. There are no bars or party places nearby. The onsite restaurant is open 8am-8pm to serve food and drinks. We only serve fresh vegetarian food, sourced as locally as possible. All of the rooms at NMS are completely off grid. We have solar power for lighting and charging your devices plus solar hot water in most rooms. All of the water is supplied directly from our own source so fresh spring water can be enjoyed from every tap. We work hard to maintain and further develop this Sanctuary. Offering more comfort to our guests and increasing biodiversity for nature´s recovery are our main goals. Noticing an increasing amount of wild animals like monkeys, birds, butter- and fireflies, deer and many more species since we first came here, makes us very happy and encourages our work. The positive feedback of our guests fuels our work. Also we would like to inspire the local community to take more care of their unique environment through protecting trees & animals (especially the unprotected rainforests like our Diyadawa range). Unfortunately even Sri Lanka´s last primary rainforest the Sinharaja is endangered through illegal logging, mining, expanding tea plantations and a growing population. Avoiding plastics and using more renewable energy is another topic we like to promote. 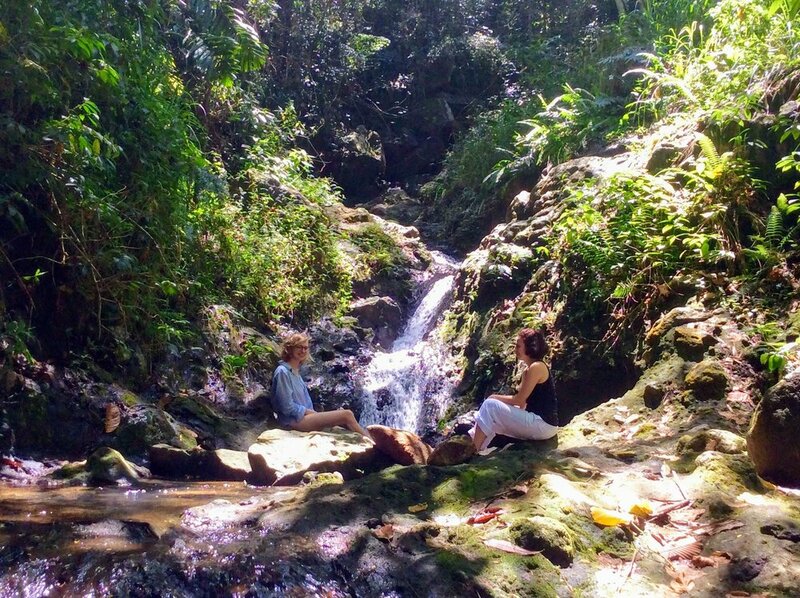 We believe that new ideas like combining living self sustainable and sharing this experience with visitors can be adopted by locals in order to make an income through ecotourism and save the rainforest.